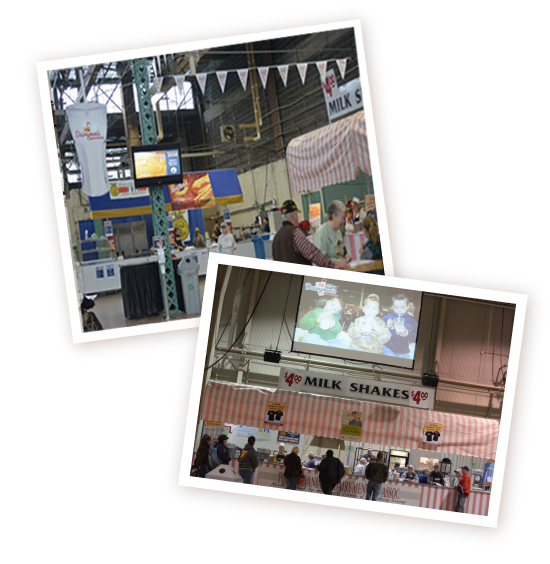 has provided smiles to visitors to the Pa. Farm Show in Harrisburg, Pa. in the form of delicious, frothy milkshakes. The Association also provides fried cheese cubes, ice cream and grilled cheese sandwiches during the Pa. Farm Show. We're Proud to be a Partner in the New Statewide Campaign "Choose PA Dairy: Goodness That Matters"
Making the choice to buy local milk is important for your health, your family’s health, your local community and the commonwealth. Pennsylvania-produced milk and dairy products can be found in grocery stores, markets and local restaurants. 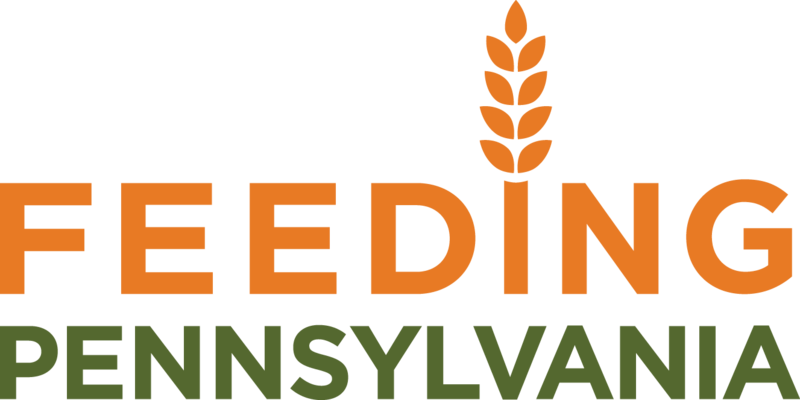 We've help launch the first state-wide program with Feeding Pennsylvania to Fill a Glass with Hope. Help us reach our goal of delivering fresh milk to our neighbors in need. Did you know that 1 in 5 kids in Pennsylvania are hungry? Together, we can Fill a Glas with Hope so no one goes without fresh milk. Each $1 donated equals 8 servings of milk. Within 17 years, the county group had become a statewide organization with a focus on supporting Pennsylvania dairy farms. In 1954, the Association joined together with Valley Grange #1360 from Lewisberry, Pa. to serve hand-dipped milkshakes at the annual Pa. Farm Show. More than 65 years later, the Association is still serving their now famous milkshakes each year to Farm Show's visitors. The Association also provides fried cheese cubes, ice cream and grilled cheese sandwiches during the Pa. Farm Show. Proceeds from the sale of milkshakes benefit agricultural scholarships, youth programs and educational programs across the state. The PA Dairymen's Association is governed by a dairy farmer Board of Directors and is lead by executive director is Dave Smith. PA Dairymen's Association was originally formed as the Crawford County Dairy Association in 1871. Within 17 years, the county group had become a statewide organization with a focus on supporting Pennsylvania dairy farms. In 1954, Association joined together with the valley Grange #1360 from Lewisberry, Pa. to serve hand-dipped milkshakes at the Pa. Farm Show. More than 60 years later, the Association now serves 140,000 of vanilla, chocolate and mixed milkshakes each year! Proceeds benefit agricultural scholarships, youth programs and educational programs across the state. The PA Dairymen's Association is governed by a Board of Directors made-up of dairy farmers. The Association's executive director is Dave Smith. Show your love with one of our new gifts! 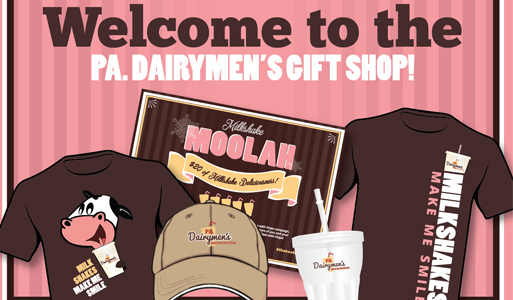 We have t-shirts, hats, milkshake gift certificates and milkshake cups available. Please visit these dairy organizations for more information on dairy farming and farmers. The PA Dairymen's Association is proud to support agricultural scholarships, youth programs and education programs in Pennsylvania. As a non-profit, the Association supports Pennsylvania agriculture by funding agricultural scholarships, youth programs and education programs across the state.